Hazrat Ali Akbar (PBUH) was born on Sha’ban 11th, 33 AH or 35 AH or 41 AH and was martyred on Muharram 10th, 61 AH in the Battle of Karbala along with Imam Hussain. “Tolerate my dear, today will not end, until you are satiated with your forefather- Prophet Muhammad’s (PBUH) bowl (he will give you water). Hazrat Ali Akbar fought till the arrows torn his throat. While he was rolling in his blood, he called out: “Dear father! Peace be upon you, this is my forefather, God’s prophet, who sends his regards to you and says: Hurry up and come to us”, then got martyred. 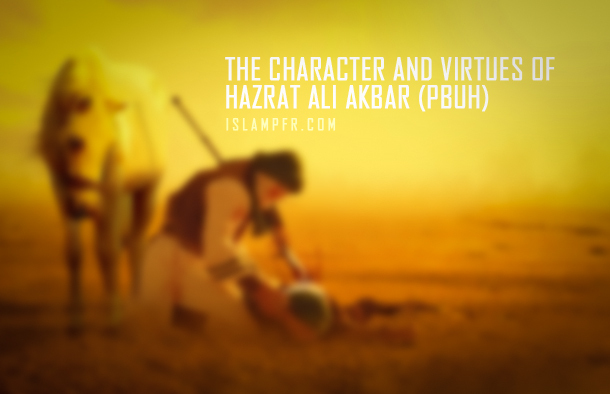 Hazrat Ali Akbar (PBUH) had the most beautiful face and the best character. [when he was going to the battle field] Imam Hussein’s (PBUH) eyes became full of tears and said: “Oh Allah! Attest that a young man went to the battle field who is the most similar person to your prophet regarding his appearance, moral characteristics and speech. Whenever we desired to visit your prophet we looked at Ali Akbar. Abu Ishaq says: “I asked a woman who had already seen the prophet in hajj to describe his face.” She said: “The prophet’s face is like the full moon and I’ve never seen anyone like him before and after that” and Rabi, Mas’ud’s daughter, narrates: “If someone sees the Prophet (PBUH), in fact he will see a glittery Sun”. “If someone meets the Prophet (PBUH), in fact he will see a glittery Sun”. This was just a brief description of Prophet Mohammad’s (PBUH) beautiful appearance and as it was mentioned earlier, Hazrat Ali Akbar is the most similar person to the Prophet in appearance, hence the indescribable beauty of Hazrat Ali Akbar (PBUH) is discerned. But the second similarity of Hazrat Ali Akbar to Prophet Muhammad (PBUH) is that he is the most similar person to the Prophet (PBUH) regarding morality, behavior and gesture. This explanation is due to the fact that no one’s attitude is better than the ethics of Prophet Muhammad (PBUH). Yet we know there are many aspects of good morals. The person who has the best ethics, in a way that he is a blessing and a model for the whole world, is at the highest level in all moral attributes. However the most similar servant of God to Prophet Muhammad (PBUH), is Hazrat Ali Akbar. This means that like his noble ancestor, he has the highest position of virtue and is the source of blessing and model for people of the world. Accordingly, Hazrat Ali Akbar (PBUH) is the most similar person to Prophet Muhammad (PBUH) in terms of speech and utterance. The status of Hazrat Ali Akbar (PBUH) was so high that even the enemies of Ahl al-Bayt (Peace Be upon Them) confessed that. By this remark Imam Hussein (PBUH) expresses his extreme interest and love to his son. The martyrdom of Hazrat Ali Akbar (PBUH) and his death is so hard for Imam Hussein that he considers living in this world without Ali Akbar (PBUH), worthless. And another point is that the respect and sanctity of Hazrat Ali Akbar (PBUH) is the same as the respect for Prophet Muhammad (PBUH) and by being disrespectful to Ali Akbar (PBUH) in fact Prophet Muhammad (PBUH) was defiled. Hazrat Ali Akbar (PBUH) has many virtues that certainly it does not fit in this brief article and we explained only a part of his dignities. Death : Martyred in Karbala (Iraq) at the age of 18, on friday, 10th Muharram 61 AH and buried there. Hazrat Ali Akbar (a.s.) was the son of Imam Hussain (a.s.). He was a handsome young man of eighteen. His mothers’ name was Umm-e-Laila (a.s.). He was also a brave soldier. He had been taught fencing and archery by Hazrat Abbas (a.s.). He so much resembled the Holy Prophet (phuh&hf) that Imam Hussain (a.s.) was often heard to say that whenever I remember the Holy Prophet I look at Akbar. Ali Akbar (a.s.) had a loud beautiful voice. It was he who always recited adhaan. On the morning of Ashura day Ali Akbar (a.s.) recited adhaan. Every one knew that it was the last time they would hear Ali Akbar’s (a.s.) adhaan. Imam Hussain (a.s.) began to weep when Ali Akbar (a.s.) began his Adhaan. The ladies could also be heard crying in their tents. After Zuhr prayers Ali Akbar (a.s.) stood in front of Imam Hussain (a.s.). He said, “Father I request for permission to go and fight the enemies of Islam.” Imam (a.s.) looked at his son lovingly. He said, “Akbar, you have my permission. May Allah be with you! But Akbar, you know how much your mother, sisters and aunts love you. Go and say farewell to them.” Ali Akbar (a.s.) went into the tent of his mother. Every time he wanted to come out of the tent the mother, aunts and sisters would pull his cloak and say, “O Akbar, How can we live without you!” Finally Imam Hussain (a.s.) had to go in and plead with all to let Ali Akbar (a.s.) go. Ali Akbar (a.s.) fought very bravely. No one dared come close to him in single combat after he had killed many well known warriors. Umar ibn-e-Sa’ad ordered his soldiers to finish off the young man saying, “When he dies, Hussain will not want to live! Ali Akbar is the life of Hussain.” While a few soldiers attacked Ali Akbar (a.s.) another (Haseen ibn-e-Nameer) slowly crept up to him and threw a spear at his chest with such ferocity that it penetrated his chest and he felt faint. As he was falling from his horse, he cried out. “O Father, my last salaams to you!” As he hit the ground the spear broke but the blade remained lodged in Akbar’s (a.s.) chest. When our Imam (a.s.) heard Akbar’s (a.s.) salaam he looked at Furaat where Hazrat Abbas (a.s.) lay and said, ‘Abbas! Now that this brother of yours needs you most, where have you gone?’ With all his strength sapped by the anguish in Akbar’s (a.s.) voice, Imam Hussain (a.s.) began to walk towards the battle-field. Let us pause briefly to remind ourselves of an incident in the seventh Hijrah. The Jews of Khaiber had revolted against the Holy Prophet (pbuh&hf). The Prophet (pbuh&hf) and the Muslims of Madina laid a siege on Khaiber. They surrounded the fortress in which the Jews had taken shelter. The Muslims could not get victory unless they entered the fortress. There was a moat surrounding the fortress. Hazrat Ali (a.s.) had been unable to accompany the Muslims due to his illness. Three days passed and the Muslims could not find any solution. Even if they got across the moat they would face the famous gates of the fortress. These were made of steel, and it is said that at least twenty men were needed to push open or close each gate. On the third day, after the morning prayers, the Prophet (pbuh&hf) summoned Ali (a.s.). Hazrat Ali (a.s.) immediately responded. He jumped his horse over the moat and with one hand swung open both the gates of the fortress with such force that they broke off their hinges. He carried them and put them across the moat to form a bridge. The Muslims rode into the fortress and conquered Khaiber. Now let us go back to Kerbala. When Imam Hussain (a.s.) got to where Akbar (a.s.) lay he took him in his arms. Akbar had his right hand on the chest. He placed his left arm over the shoulder of his father. Hussain (a.s.) said “Akbar, why do you embrace me with one arm only?” Akbar (a.s.) would not reply. Hussain (a.s.) tried to move Akbar’s (a.s.) hand. Akbar (a.s.) resisted. Imam (a.s.) gently moved the hand. Then he saw it! He saw the blade of the spear. Imam Hussain (a.s.) laid Ali Akbar (a.s.) on the ground and sitting on his knees he put both his hands on the blade of the spear. He then looked at Najaf, and cried out, “Father, I too have come to my Khaiber!”. He pulled out the blade. Angel Jibraeel (a.s.) cried out “Marhaba! Marhaba!” Akbar (a.s.) took a deep sigh and then lay still.